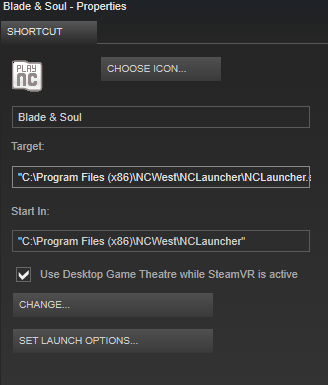 #1 Go to your Steam Overlay and select "ADD A GAME..." then click "Add a Non-Steam Game..."
#2 Browse for the Blade and Soul program to check mark it and press "ADD SELECTED PROGRAMS". 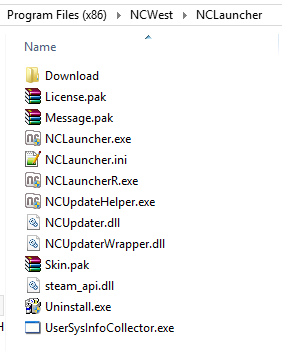 "C:\Program Files (x86)\NCWest\NCLauncher\NCLauncher.exe" /LauncherID:"NCWest" /CompanyID:"12" /GameID:"BnS" /LUpdateAddr:"updater.nclauncher.ncsoft.com"
#6 After this you can Close properties and launch Blade and Soul through Steam to get the Steam Overlay in-game! 1. Your Blade and Soul isn't the default directory such as C:\Program Files (x86), etc. 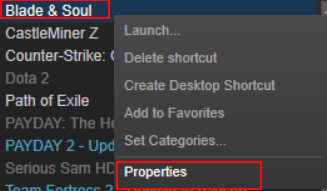 If your Blade and Soul is in a different place than the default or it's just different what you can do is go to your desktop and right click the properties of your Blade and Soul to find the "Target:" and "Start In" information you need. Awesome. I'll have to give it a try sometime. This also doesn't work if the client is installed on a different partition than the launcher. Afaik the launcher is always installed in C: and it can't be changed so if you installed the client elsewhere it's not going to work. Well you could probably copy it to a different drive if you wanted to. I'm sure there's a way. Mine pops up and acts like I'm not playing it anymore. Yeah, that might be the problem. I always have my Steam to auto run as admin. Changed the target and start in, still get immediate launcher error whenever I try to run the game through steam. Steam is running as admin automatically. Edit: apparently the target change didn't stick the first time. It seems to be working now. worked like a charm!!!!!!! thank you!!! i love you!!!! Doesn't work and everything is set up exactly like this with default installation directories too. Running Steam as admin as well, I wasn't previously, so it didn't change anything. Edit: Got it working, copied info from official shortcut and pasted into Steam. Edit2: Running as admin may be required. 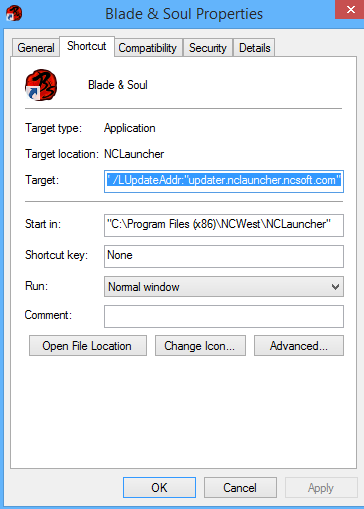 Target: "C:\Program Files (x86)\NCWest\NCLauncher\NCLauncher.exe" /LauncherID:"NCWest" /CompanyID:"12" /GameID:"BnS" /LUpdateAddr:"updater.nclauncher.ncsoft.com"
Edit: It's working now that I copied the stuff from my official shortcut... I don't see any differences though. 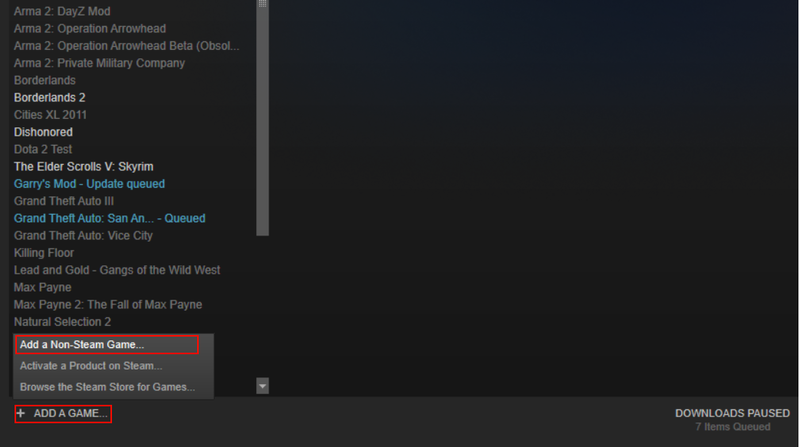 Go to 'Add a Game' Than select 'Add non Steam Game'. Look for 'NCLauncher2' tick mark it and 'Add Selected Programs'. "C:\Program Files (x86)\NCSOFT\NC Launcher 2\Matryoshka.exe"
"C:\Program Files (x86)\NCSOFT\NC Launcher 2\"
Run Steam as Admin. You sould be able to play BnS now, though im still trying to figure out how to get the overlay to work now. It only show on my friend list that im playing Blade and Soul. This doesn't let me play the game with controller. Also: The overlay only comes shortly in the login window afterwards it doesn't show up anymore. Anyone a solution for this? Go to Settings>Controller>Desktop configuration (classic client) or gear icon>Base configurations>Desktop configuration (BPM). Create or edit a KB+Mouse emulation preset. Set everything in whatever way you want. Save this desktop configuration and open BnS. Use Export Configuration>Personal to really save it into Steam's servers. Now you can open and play with your controller even if it's not added as a non steam shortcut. You can even open Steam after opening the game. The only requirement is that Steam must be run in admin mode. The in-game UI and all prompts will be set for KB+M, so some key learning is needed. But a benefit is that now people can speak to you in game terms and you will know which keys they are talking about without having to translate them into gamepad controls. L track pad: mouse move. Go to additional settings and set edge spin speed to max and edge spin radius to mid way. These are my personal settings I feel good with. You can do better settings than these, but I feel these cover most of what's needed to do combat and move around.